It’s important to keep outdoor hard court tennis surfaces well maintained and thoroughly cleaned with a Pro Tennis Cleaning Solution on a regular basis. This is to prevent damage and to stop contaminants like moss and algae from growing on the court and making it slippery and unsafe for use. Sports court contractors use this specially designed surface cleaning solution to remove dirt and debris from both macadam and polymeric surfaces to improve the playing qualities and the appearance of the facility. We can provide more information on these products if you are interested in how they are used. Just fill in our contact form and get in touch with us to find out more. 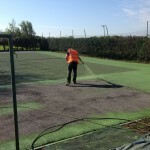 We carry out maintenance to sports courts all over the UK and the chemical make-up of the Pro Tennis Cleaning Solution that we use is specifically designed to remove tough dirt and contaminants which get stuck to the surface. These contaminants can include litter, leaves, mud and other organic matter which decays and gets stuck within the pores of a macadam or polymeric surface, leading them to become blocked so water can’t drain away. When this water starts to build up on the surface it provides an ideal breeding ground for moss and algae which then make the court even more slippery and unsafe for use by players. 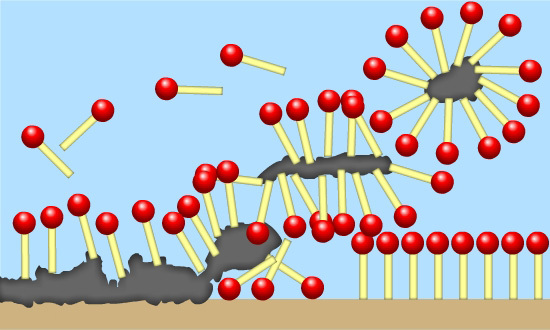 The way that the surfactants are able to bond with both the water and the dirt means that the two can then mix and the dirt is removed from the surface of the tennis court, leaving it clean and free from debris. Other ingredients within the Pro Tennis Cleaning Solution include bactericides and preservatives which are commonly used to prevent the growth of mould in household products. In terms of cleaning sports courts, these substances can stop bacteria from infecting the surface of the court and leading to moss and algae growth. This is important for preventative and proactive maintenance because most types of moss, algae or fungus will thrive in damp and dirty conditions like tennis courts especially if the area is shaded by trees or nearby buildings. 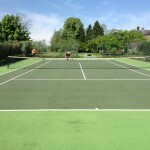 If you have an outdoor hard court tennis facility which has become dirty over time, it is likely that the Pro Tennis Cleaning Solution will be enough to remove the dirt and bring back the original performance quality. 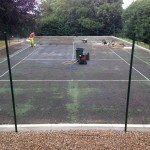 However if the sports court has sustained further damage and has started to develop fretting and very poor drainage, a stronger maintenance approach may be needed. This could include repairing cracks in the macadam or polymeric rubber surface, or applying a binder coat to seal over the loose stones and then putting a new anti slip paint coating on top. A fresh layer of paint with a binder coat underneath will drastically improve the look of your tennis court as will as providing added grip for enhanced game play. 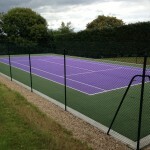 If your tennis court is in need of a thorough clean and fresh paint coating, please get in touch with us through our contact form and we’ll discuss the Pro Tennis Cleaning Solution in more detail as well as offering you advice on pricing and costs for this sort of work. You can also have a look around the rest of our website for more information on all of the sports facilities we can install and provide services for.